This week we have a postcard from 1911. It depicts a ball and chained cartoon convict escaping from a "calaboose" which I learned is another word for a jail. The sheriff is in hot pursuit! "THEY WANT ME TO STAY THE WORST WAY," strikes me as more quirky than humorous. I suppose humor changes over the centuries. The postcard was sent from Adrian, Michigan and is dated July 14 of 1911. 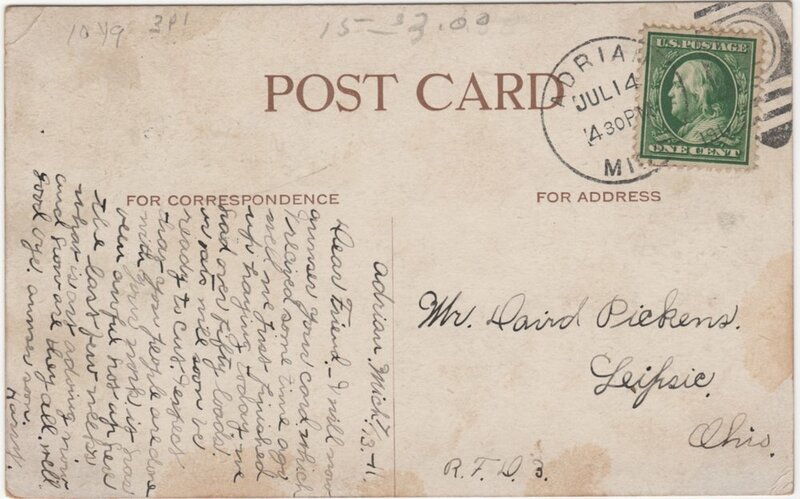 It was addressed to a Mr. David Pickens of Leispic, Ohio. He lived on R.F.D. 3. (Rural Free Delivery). Here is a closeup of the message written on the back. I will now answer your card which I received some time ago well we juss finished haying today we had over 50 loads. ??? will soon be ready to cut. I expect that you people are done with your work. It has been awful hot up here the last few weeks what is ?? adoing now and how are they all. Well good bye. Answer soon. I am nearly sure this is the David Moe Pickens (1888-1975) who lived his entire life in Leipsic. Here is his Find a Grave memorial. This appears to be his obituary from January 6, 1975 in the Findlay Republican Courier (Ohio). A very quick search on Ancestry suggests that there is a lot of good information on this man. He appeared to remain unmarried and working on the family farm for his whole life. I wonder what other sorts of details might emerge with some more in depth searching. Feel free to give it a go an let me now what you find. How cool is the name "David Moe Pickens" for a farmer in 1911? Who was Harry and what was his relationship to David? When is the last time you sent your buddy a postcard? What do you think, feel, and wonder about as you read this postcard? What are some of the words in the message that I couldn't decipher? Is there anyone out there connected to Mr. Pickens that might enjoy having this family keepsake?